*A note on timing. For ease of reading, a comma should be seen as a short pause (1-2 seconds), a semi-colon as a longer pause (2-4 seconds), a full stop as longer again (3-6 seconds). and line breaks should be time for some concentration or consideration (several seconds). Imagine you are a tree. A mighty oak or a fluid willow; whatever tree you feel you connect with, or would like to connect with. Take a moment to feel your rough bark; taste the moisture in the air, and become familiar with yourself as this great tree. Concentrate on the base of your trunk, what was once your ankles; and feel how solid you are; how connected to the earth. Think about your roots and follow them down into the earth. Extend them; find the pockets of water hidden in the fissures of the Earth and drink deep of its sweet taste. Use this energy to grow further; reach down, deep into the Earth; towards the core. Feel the warmth of the mantle below; the flowing energies of the Earth itself. Spread out over the molten core to cover as wide an area as you can and embrace and rejoice in the life it provides. You cannot be burned, but you can feel the warmth, the life, the energy and the power of our Mother. Leave here anything you need to let go of to be burnt in the fires of the core. Hold onto some of that Earth energy and slowly bring your consciousness back up through your root system. Follow the roots up through the Earth; away from the mantle and through the fissures in the rock. Raise yourself back up towards the surface; energised with the love and warmth of Mother Earth. Move up your trunk and feel your strength. The mass of timber which keeps you so strong; so powerful; immovable. Move your consciousness upwards to where your limbs begin. Move outwards into your limbs and taste the freshness of the air. Feel the refreshing breeze; and the light of the sun (or moon) being converted to sustenance through your leaves. Embrace the energy of the sun (or moon). Grow towards the stars and embrace the energy they offer; the energy of the universe. Extend your consciousness to embrace the stars; feel their life; their energies; each one slightly different; each one the same. Embrace the universe; the source (or God and/or Goddess), and rejoice. Leave the universe where it was, but bring back some of that energy, some of the serenity; and some of the chaos left from the creation. Return to your branches. Follow them back down your limbs, once again to the trunk of your body. You are the great tree; of this Earth but also of the stars. A being of the universe; separate, but part of the whole. Once again feel the solidity of your trunk. Embrace your whole being and rejoice in the fact that you exist. Seek again the calm of the tree; the solidity of self; and return. Retract your roots and branches once again; bring them back to the centre and return to your humanity. You are yourself again, but connected. You are home again, but part of the whole. Feel your feet; connected to the earth. Stretch your arms; connected to the sky; and rejoice. What follows below is a response I typed out to a group of international interfaith professionals. The original query to me asked how I would achieve salvation and how I hope to save others if I do not accept Christ as my saviour given our fall from grace. There was more about morals, ethics and Gods justice, and how God regulates these things in people who think differently than the querent but you will see these things as you read on…. Keep in mind, I am responding to someone that sees God as wholly male and who literally created man in his image, as such my language is written for someone with that perception. What is there I need to be saved from? I do not believe in hell, or a God who will punish me. The only thing I may need saving from is myself or the situations I have placed myself in. I equally do not see that I need to save others from anyone but themselves. To do that, I try to promote knowledge and growth in them. Get them to undergo self-analysis to the point that they see their own problems and choose to fix them. Time and again I have ‘told’ people how to fix their difficulties when they have asked for a solution to their woes, but if they cannot see the problem they cannot or will not correct them (keep in mind I live in Australia where hunger and shelter are not issues for the majority). “Gods justice” is simple in Australia, if people behave poorly, their life tends to be lacking. If they act nobly, their life seems to be much better. These karmic or ‘rule of return’ principles are alive and well with or without a belief in Christ; Hell; Godly punishments. It’s nice to have the Jesus mythos there to call on, but it is just that to a non-Christian, a collection of really good myths. This does not detract from my sense of morality nor my strong ethical views nor even my sense of charity; a belief in a saviour or Christ or even a God is not a requirement for these things. Reward and punishment happen here and now, I personally believe they also carry across to our next life and that this may have an effect on our immortal souls, but that’s not to say I am correct. It is simply what I believe. On the same note I believe with all my heart that your God, Jehovah; Yahweh; Elohim, is the same as Allah, and Brahman, and the essence behind Buddhism and Humanism. There are differences, but at the core of things we all believe the same thing. We all believe in love and charity and hope and that murder is wrong and that we should protect the only Earth we have. The only ‘fall from grace’ I have had was due to the ignorance’s and antics of my youth, not 2000 years ago. I have returned to grace and take joy in living in it here and now. I try to help others achieve the same joy by talking of how I got here, helping them to see the signposts left for them in their own lives, and helping them bring about change for the better. Is it hard to regulate… well no, we each have a divine spark, a part of God within us. We can each learn to access this. It is not hard to regulate because I have a personal relationship with God, both that part of God within me and that much greater part of God in the world all around me, in the people around me, in the trees, the sky, and the wind. God is everywhere and I talk with him often, He answers my queries and leaves little messages for me so that I do not stray. I see God differently to you because that is how God has presented Himself to me. God is not a punisher of naughty children; not an old man with a white beard; God is not a lot of things that we think He is. God simply is, and he presents Himself to us in the way that we will recognise Him. Unfortunately because we are so limited in our own cognitive and sensory abilities not one of us can fully comprehend what or who God is. We all fall short but we each have part of the truth, and you know they say half a truth is akin to a lie. I know and talk to God, but this does not mean my view of God is right. It is however, right for me and the messages I have received from Him are the ones I pass on. All Gods are One GOD; we are not capable of fully understanding God; religious organisations represent religious organisations; Gods message, no matter who receives it, is tarnished by human perception; Gods love is available to everyone regardless of religious affiliation; God turns no one away. These things I believe to the core of my soul. I know them to be true because I was told them by someone I love and trust and that each of us sees differently. Despite all that, I know I am fallible, that the message may be skewed by my own perception and that others may have part of the message which I have missed, but I also know God is quite happy with my perception at this time. 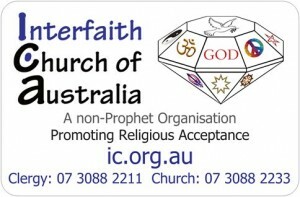 I believe in interfaith, so much that I have started my own ministry with the first Interfaith Church in Australia. I know God in the fullest sense of the word, but I also believe I cannot hope to fully understand God. I expect that by definition this makes me agnostic but the knowledge that God is beyond my comprehension does not make me any less His servant. Now I don’t normally preach and I feel like I’m on a pulpit here, so apologies. My views of God are extremely strong but they should not be taken as anti any other beliefs, we do, after all, each see God differently and my views should not detract from anyone else’s relationship with the divine as they see it. Well today I put my neck on the block and risked my paid employment and my health. I emailed the Australian Health Minister and the Executive Director of the Princess Alexandra Hospital where I am currently on a waiting list for corrective surgery. If the worst happens, I may lose my job in education and not get the surgery I need when I get to the top of the waiting list in about 2022. Well, maybe I didn’t really risk my health…..
Below is a copy of the email. I recommend that if you are on a waiting list, you too should take action. Sadly it appears my days on the bike are nearing an end. In the next few days/weeks I will sell my bike and look into purchasing a car. I will miss the freedom of the bike, the connection to the seasons from the wind in my face and the sun on my back, but with each change in life comes opportunity…. so I have ordered some goodies for the doors and boot…. I am not a great believer in the teachings of the modern Church. I personally think a lot of the teachings of the Christ are misinterpreted through the words of the bible and the objects of the Church and this is something that often saddens me when someone comes to my door spreading the word of their Church instead of the teachings of the Christ. Jesus was intelligent, charismatic, learned and an incredible teacher/ orator/ magister. A true prophet of God and the Abrahamic religions, but I do not see him as the only messenger of God. I see many others passing the same message in different lands or at different times, all with many of the attributes expected of the Christ. Krishna, Confucius, Baha’u'llah, Zarathustra, Abraham, Solomon, the Völva, Mohammed, Moses and many more have provided messages to the people with apparent divine inspiration. Taken in context, allowing for variations in language and the time the message was delivered – forward to the 21st century language we use today, the message is invariably the same. Some were delivered to agricultural people such as the first Christians, others to nomadic folk (Islamics, some Asian peoples), and so on. All were delivered to people who think very differently than we do today in a world with mass communication, mass production and mass transport. Admittedly contextualizing something written over a thousand years ago is difficult, but these messages come from many prophets to many people over the entire age of man from what I believe is only one God, one eternal source. 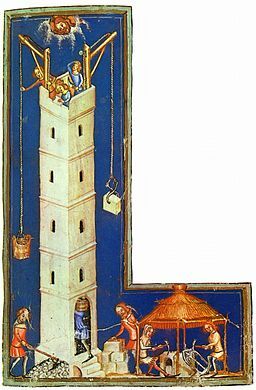 The story presented in the Tower of Babel myth tells us quite clearly that man fell from grace and God confounded our ‘language’. Like so many other things in religious scripture, this does not necessarily have only one meaning, there is much more to ‘language’ than just the surface meaning. It could mean not only speech, but thought too, certainly people who think in a different language to me, even if they speak fluently, are harder to understand when we are communicating in depth. Language may also include religion, for how could this have really occurred, ‘the confounding of speech’ if the confounding of a single religious path didn’t also occur? God wanted us to be different peoples, I don’t know why, or if it is simply an explanatory myth so we can make sense of the fact, but it is a simple enough fact that as we have multiple religions we are confounded. Because of the strengths we have gained through our division we are at a point where we can rebuild the tower. 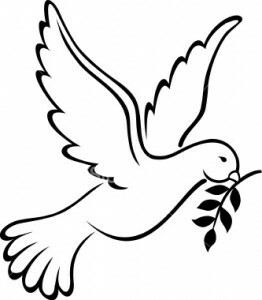 We can bring the peoples together again to speak the same language (religion) through Interfaith. Simply by accepting that we are all the same, all seeking God or Heaven or Enlightenment (same concepts/ goals, different words), we are all brothers and sisters in Gods eyes and we have the potential to build a peace that has not occurred since before the ‘tower’. I am not one that believes the only way to God is through Jesus. Despite that I too have had prayers answered, live in the presence of God and have had my own miracles and revelations. I have come through hell into a life of service, blessed and happy on earth and secure in my own knowledge that after death I can be weighed as good upon any scales. ‘Religious acceptance’, accepting that another’s religion is right for them, that our goals are the same even if our individual paths differ, is the only way forward, the only way we will ever be one people again, the only way to everlasting peace and to the Heaven on Earth that will result from it. If my path is not your path, that is OK. We all need to walk our own path to God. Accepting this, that we can walk different paths, is the goal of our Church, and I believe of the interfaith movement. Gods Truth, like all truths is a three edged sword. What is true for me, what is true for you, and the real truth, untainted by our perspectives. Gods Truth, unlike ours, is not subject to our limited knowledge, our limited understanding, our personal prejudices or any of our other foibles or limitations. Gods Truth is that we are all His children and that we shall all return to God if we live a life worthy of Him, no matter how we see Him within our limited capabilities. N.B. Even though I refer to God as singular and masculine, I do so only to enhance understanding – to move closer to one language, in this case the language of the majority of Australians whom I see as visioning God in this way. 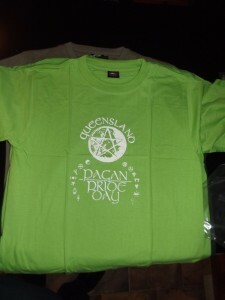 $12.50 +postage (a 500g satchel is $7.20) or pick up from Waterford West, Qld 4133. These items were donated to the Interfaith Church of Australia. 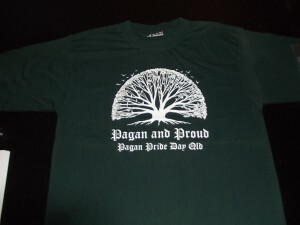 They were printed for Pagan Pride Day in Queensland. 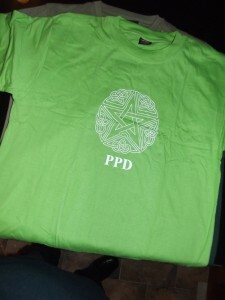 PPD occurred in Brisbane in 2002, 2003 and 2004 and these items have been in storage since then. 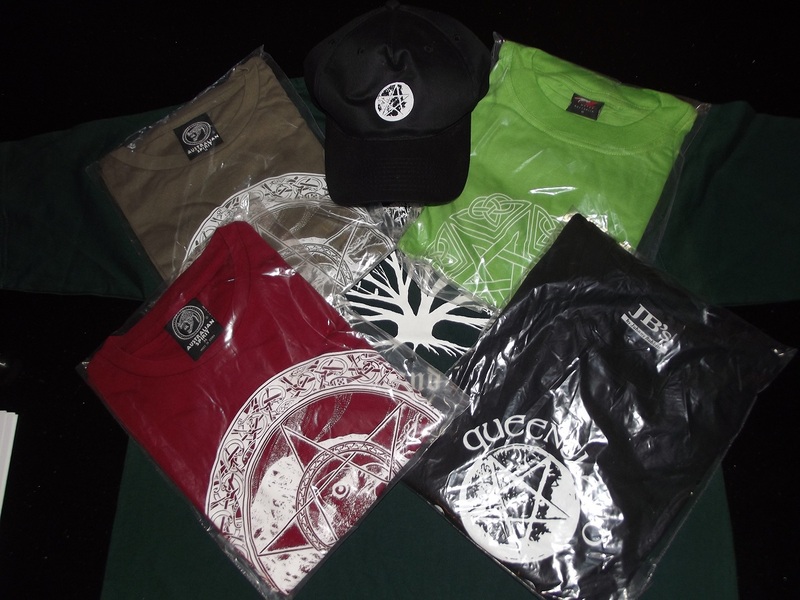 All items are 100% cotton, brand new, never worn and most are in their original packaging. 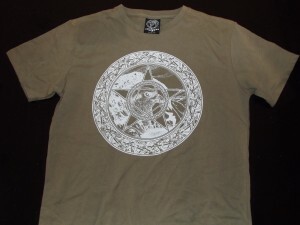 Other colours and sizes are available in this design. 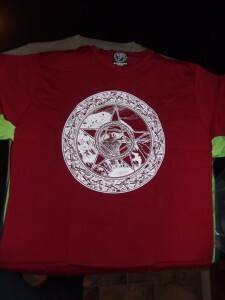 Other designs are also available (more photos coming and at http://www.ebay.com.au/sch/pshopqld/m.html). Sizes from XS to XL. All monies raised will go directly to the Interfaith Church of Australia. The Interfaith Church is registered as a ‘Charitable Institution”. 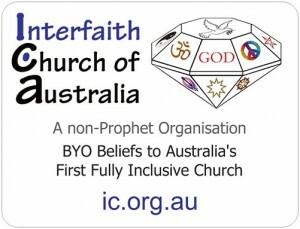 For more information about the Church, please see ic.org.au. One theology I do like so far as judgement goes is that of the old Egyptian beliefs. The story for this belief goes something like this. On death the person travels to Duat (the underworld) in the company of Anubis (a God of the afterlife) [left quarter of the papyri]. In the Hall of Two Truths his/her heart (the seat of the soul) is weighed against the feather of Ma’at. Ma’at is the Goddess of Truth, Justice & Harmony, in her headdress she wears an ostrich feather also called the feather of truth or the Shu-feather [2nd quarter from the left]. If the heart weighs more than the feather, Ammut (a crocodile headed, lion bodied, hippo hind-quartered Goddess) devours the soul and they are destroyed forever, if the heart weight the same as the feather they then are presented to Osiris (another God of the afterlife) by Horus and they can then journey on with Anubis to Aaru (the reed fields – akin to heaven/paradise). Thoth (God of Magic, Writing & Truth and scribe to the Gods) stands by to record the outcome [right half of the papyri]. Most of this works fairly well for me however my idea of ‘heaven’ is somewhat different than the reed fields of Aaru. How would you feel about having your heart weighed against the feather of Ma’at? Would you be confident in the continuation of your soul under this theological idea? Harvard University and the Massachusetts Institute of Technology (MIT) have joined together to form a new entity, ‘edX’, which will offer free online education. The current offering of only one unit of study (beta testing) has resulted in more students enrolling in this single unit than the entire living alumni of MIT. Future offerings are likely to include full degree level courses offered completely online and absolutely free of charge. Earlier this month Harvard and MIT held a press conference announcing this new initiative which they hope will revolutionise the education sector. Early media releases include articles from the New York Times and EdX via YouTube. This concept, massively open online courses, known as MOOCs looks set to take the education industry by storm with several other top quality universities including Stanford and Princeton indicating that they also will be providing MOOC offerings in the near future. At this stage, it appears possible that Harvard Divinity School may have online courses available in the very near future. Other similar courses may also be available from alternative service providers. Where these courses become available it is now unlikely that the proposed Interfaith College will develop courses on the same subjects as recognition of courses from other providers will reduce current workloads.